Sho Katayama was born in Dinuba, California on June 13, 1919 to Tomoji and Takeno Katayama. He graduated from Orosi High School in 1937 where he ran track and pole vaulted (with a bamboo pole into a sawdust pit) and played football under coach Pete Biden. He worked on the family farm with his dad and brothers (twin)Yo and Mike. 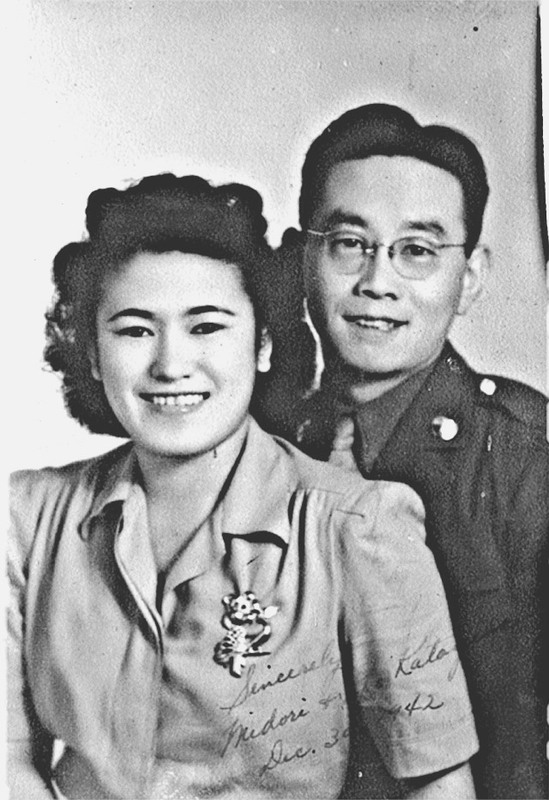 He married Midori (Dora) Mori in Fort Riley, Kansas on Dec. 30, 1942 after he had enlisted in the Army. He joined the 442nd Regimental Combat Team E Company, serving in the Infantry as a bazooka man. It was an all-Japanese unit that became the most decorated unit in the history of American warfare, years later receiving a Congressional Gold Medal. Sho spoke of walking from the bottom of the boot of Italy up into southern France and later serving in Germany. He was wounded twice and he helped liberate the town of Bruyeres, France, and rescue the Lost Battalion from Texas. Returning home, he went back to farming but later pursued other careers in mutual fund sales and in the trucking industry. He was an active member of the Lions Club. He was named "Man of the Year" by the Cutler/Orosi Latin American Club in 1998. He served on the Board of Directors of Orosi Foothill Citrus Association, the Nisei Center, Orosi Chamber of Commerce and a lifelong member of the Veterans of Foreign Wars. He worked for years as an Orosi Memorial Board Member and volunteered at Bingo for the Community Youth Program. Sho enjoyed his life to the fullest and was constantly on the go. He was an avid hunter and fisherman. He loved going clamming and abalone hunting. He bowled for years in the local league. At one time he had a boat and could water ski on double and single skis. He spent many hours in his vegetable and flower gardens and tending all of his different fruit trees. He loved playing pinochle, gin rummy and poker but his favorite pastime was going to the casino with friends and family, just edging out eating donuts and drinking coffee with his buddies. At age 90, he moved to Boston, Massachussetts to live with his daughter’s family and made a remarkably smooth transition to the East Coast. Sho was a generous, fun-loving, quick witted and wise man. He laughed a lot. He was a grateful person in his later years, almost daily expressing appreciation for a long, happy and healthy life and especially for his wonderful family and friends. He passed away at the Brockton Veteran Administration Hospital on November 12, 2017, after a long severe case of shingles. He was preceded in death by his parents, his siblings, Yo, Mikio and Fumi, and their spouses, Rosie, Grace, and Yuk, and by his wife of 47 years, Dora. He is survived by his daughter, Barbara, her husband, Kevin, and grandchildren, Tana and Kyle, as well as many well-loved nieces and nephews. A viewing will be held in Massachussetts on November 17, 2017 from 6 to 8pm with a brief prayer service at 7 pm at the Robert J. Lawler and Crosby Funeral Home at 1803 Centre Street, West Roxbury, Massachussetts. There will be a funeral service at 11am on Monday, November 20, 2017 at Gateway Church of Visalia, 1100 S. Sowell Street, Visalia, California.